Holy Santa Claus, it's a Christmas miracle! For the past 20 years of our life, we've written to Santa asking for the perfect pair of Christmas-themed slippers to accompany our wide selection of holiday jammies. We have a drawer full of festive pj's— a sloth wearing a Santa hat, llamas tangled in string lines and cats batting at shiny ornaments are just a few of our favorites. We've been on the hunt for cozy slippers to flatter each and every one of our cherished Christmas pajamas and unfortunately, Santa Claus hasn't delivered but guess what? HalloweenCostumes.com has! (C'mon Santa! you're slipping.) The microfiber slippers with LED lights accompany all Christmas-themed apparel and they even light up just like the star on top of your tree! 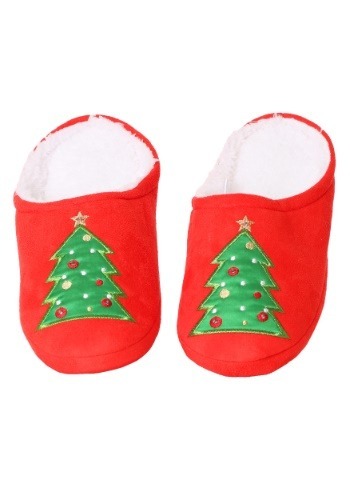 The Christmas tree LED microfiber scuff slippers actually light up with every step you take. No more dark trip to the bathroom in the middle of the night, just slip on these anti-skid slippers with plush interior and they'll light the way... just like Rudolph. Since your feet deserve a treat too. We know you already have an extensive collection of holiday sleepwear, but don't forget to check out our wide selection of pajamas!